• Advanced tank design - is a low profile impact resistant polyethylene available in 175 (663 L) and 300 (1,136 L) gallon sizes. Advanced design reduces chemical waste and agitation to ensure uniform mixture. The agitation is adjustable and can be turned on and off from the operator platform. The low profile design has better visibility and a low center of gravity. 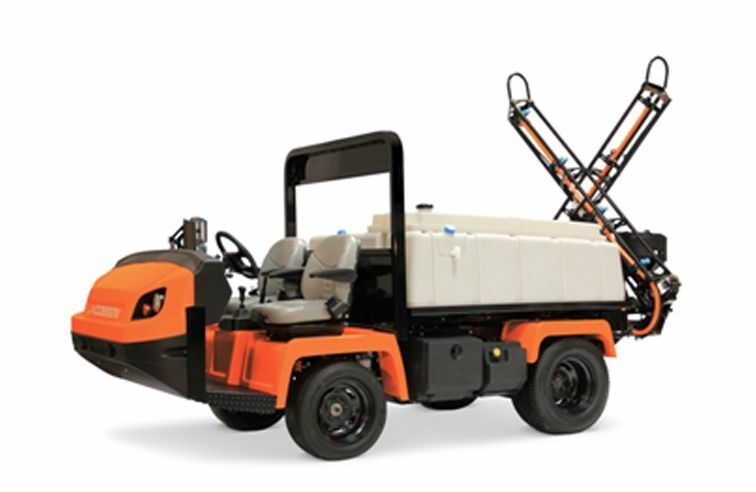 • Control options - from Raven include reliable manual electric system for pressure based spraying, computer control for flow based system, and advance GPS mapping system for reduced chemical cost. • Robust triangular truss boom - offered in widths of 15 ft. (4.6 m), 18.5 ft. (5.6 m), and 20 ft. (6.1 m) with breakaway protection. The booms are cross-folding for narrow transport width and the tri-tipped nozzles are recessed for protection. Also available with advanced precision control booms with Capstan SharpShooter® technology. • Powerful Pump - – Corrosion resistant stainless steel centrifugal pump provides 64 gpm (242 Lpm) at 60 psi (414 KPa). Equipped with Lifeguard Silicon Carbide seals for increased wear resistance. Heavy duty hydraulic four wheel disk brakes with 10.7 in. Hand lever actuated disk brakes on rear wheels.